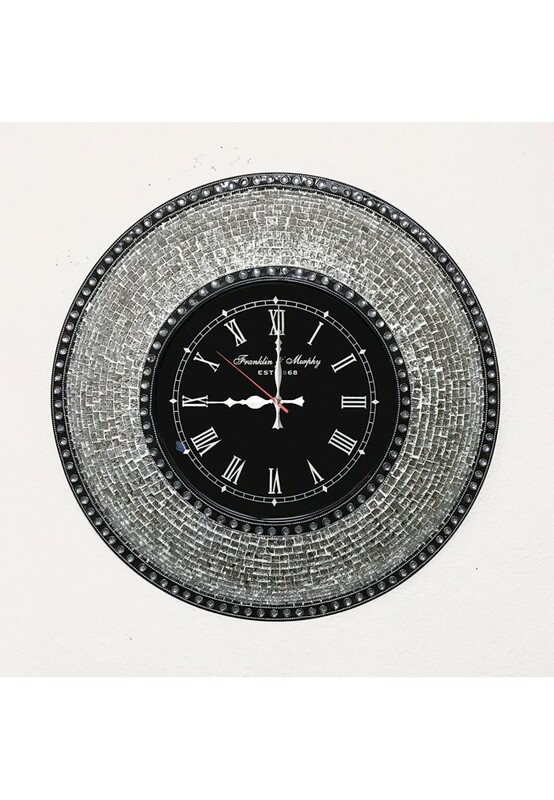 The ultimate in wall art is a functional glass clock with gorgeous, sparkling silver mosaic. 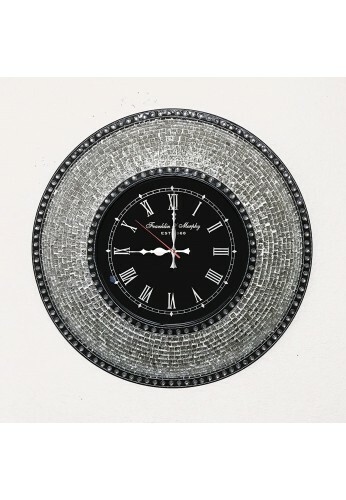 22.5" durable iron base with glass mosaic frame surrounds a round, roman numeral clock face. Our mechanical clock features a functioning second hand with silent sweep motion. Hand-placed silver tiles look like a thousand diamonds from any distance. Up close, each glass tile contains an intricate embossed pattern. Looking for a silent clock for your bedroom? DecorShore clocks are silent and stunning to look at. 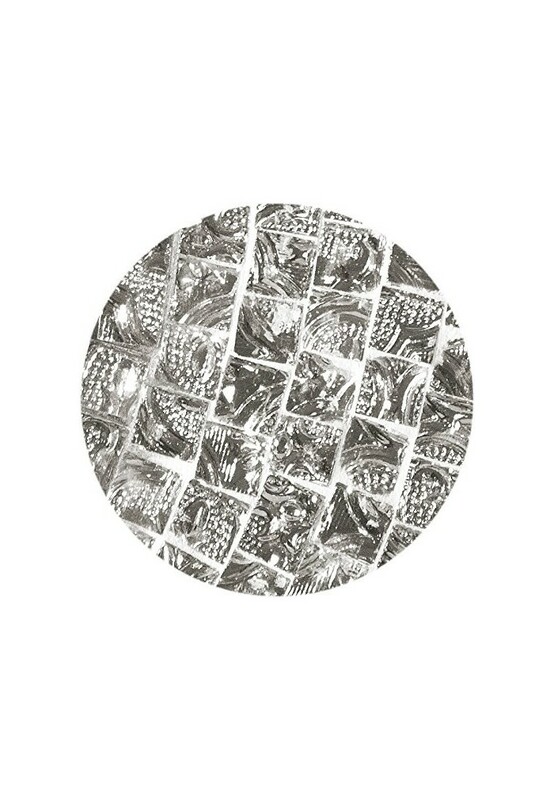 Showcasing decorative, embossed metal underlay individually cut in each glass mosaic tile. This hanging clock is artisan handmade with extreme attention to detail. Each handsome black clock face is accented with a glass beaded bezel encircling the rounded glass case. Genuine curved glass is expensive to produce, very rare, and makes this clock an instant heirloom. The ultimate luxury wall clock is all dressed up and ready to lend incredible style to your wall decor. As always, extremely limited quantities of our bespoke home decor. 22.5" Round, Decorative Wall Clock. Detailed, Artisan Handmade Glass Mosaic Wall Clock in Chic Metal Style is a True Statement Piece, Intricate Artistry is Evident in Clocks Composition. Zoom in to see the intricate artistry and mosaic work! Each Piece is Artfully Unique, Bespoke Home Décor. Limited Quantities of this Decorative Designer Wall Clock. Simply gorgeous clock. Black and Silver combination makes it more good looking.